Royal Enfield launched its new bike the Thunderbird Twinspark in 2008. But it was under some serious scrutiny by Bajaj Auto Ltd because of the name and the twin spark technology. Bajaj patents the twin spark technology and it had previously filed a suit against TVS motors for the same reason. 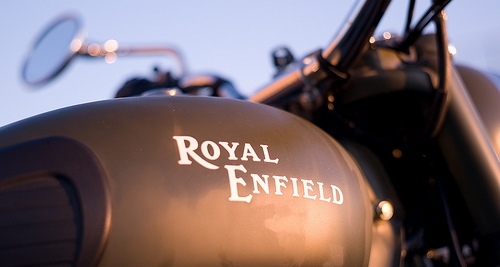 But according to Royal Enfield they have not breached the patent copyrights as it holds good for 75 and 250 cc engine bikes whereas the Thunderbird is of a 350 cc version and they plan to incorporate the same technology in their future series of bikes too. A first look, and you would be hardly able to tell the difference between the Twinspark and any other Thunderbird, till you see the engine. It’s a contemporary looking powerplant with an incorporated crankcase and gearbox projected to lessen oil seepage. 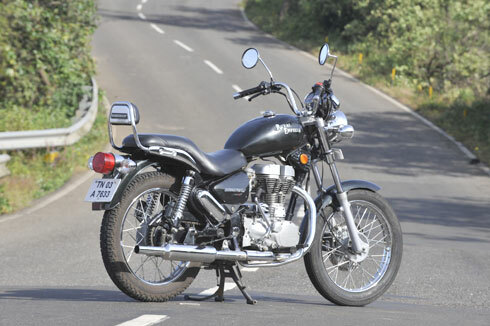 Every other bit is similar; the round headlamp, double instrument pods, front disc brake, seat and pillion backrest are all the same as the normal Thunderbird’s. A notable visual difference is the shorter muffler that we received on our test bike. The panels underneath the seat feature a minuscule ‘Twinspark’ sticker, which is the lone sign of this key technical step forward of the bike. Also on either side, just beneath the tank, are round reflectors; a helpful touch when you’re emerging from a side road onto a highway. The fuel tank is sheet-metal, and the overhang welded below it is a blemish, while the fuel tank cap looks dated. The Twinspark does well to offer slow- cam chain adjusters, as compared to the more predictable system provided on most Indian models. Paint and fit-finish is still is not upto the mark. The all-new engine has twin-spark plugs, an automatic decompression facility and unit-construction that the company claims has answered the crisis of oil discharge, a key problem with the old engine. Although a lot does stay alike, other important changes contain a high-flow trichoidal oil pump, hydraulic tappets, an automatic primary chain tensioner and the drive chain assembly shifted to the right side in order to reduce transmission loss. The Twinspark benefits from TCI ignition for a fine spark. You get 2bhp more, for a figure of 19.8bhp, and 2.85kgm of torque, which is a insignificant 0.1kgm more than the older version. Start it and you instantly notice a smoother feel near idle. The handlebars don’t judder in your hands just yet. Select first gear and as you let the clutch out, it feels a bit improved. A six-plate clutch instead of four makes the difference. As you hasten through the gears, this smoothness unfortunately diminishes however, to be replaced with Royal Enfield characteristic vibrations, Which is where it goes from bad to worse, and it’s apparent that thrashing the engine is not the way to ride this bike. Fuel economy is not a subject of relevance among Royal Enfield bike lovers, who will buy the Thunderbird Twinspark more for its lifestyle value, than economy. For the record, the Twinspark returns 35.7kpl in the city and 36.8kpl on the highway. btw according to company the fuel efficiency ranges anywhere between 45-50 kmpl. The riding arrangement of the Twinspark is classic cruiser fare, and its saddle is a sensibly pleasant place to be on long rides. The new bike has an integrated gearbox that produces only 10% more power and torque compared to the previous Bullets. So, there is not much to rejoice. It generates a maximum power of 20 bhp and the maximum torque is 28Nm. For an instant halt the bike requires 150/280mm brakes. The shifting of the rear brake has become easier. 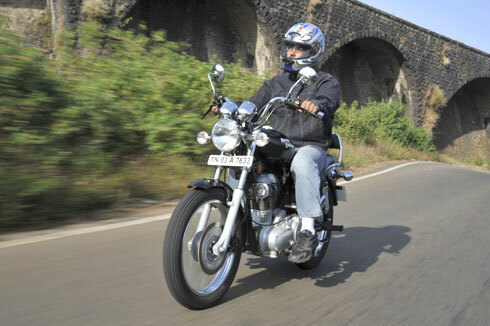 The suspension is not satisfactory; it is slightly stiffer but gets better with a pillion rider. Stability on straight lanes remains good but riding into curves isn’t any great. The front tyre seems to skid while breaking that causes some kind of discomfort. The bike is recommended for city riding and for a rare long drive too. The Thunderbird uses known, large, kicked-out forks and an extended single-downtube frame. Its gas-charged dampers at the rear are par for the course for motorcycles in India, but even on their softest setting tend to jump when pushing the bike to its edge. These work best when the bike is overloaded. The Thunderbird Twinspark is somewhat a burden in city traffic, but a steady bike on the highway thanks to its 19-inch rims. The handlebars do provide ample weight for city riding, but there is no dodging this bike’s rangy wheelbase and heft in the city. The new Thunderbird Twinspark will not have a mad following like we see for Pulsars or Karizmas but is liked by people who already own a bullet and those who do not have one but have a liking for the brand. You might not see 100s and 1000s of these on roads, but one on road and it is a head turner. The Royal Enfield Thunderbird Twinspark is available in three colours: Silver, Black and Red and is handsomely priced at Rs 103000. 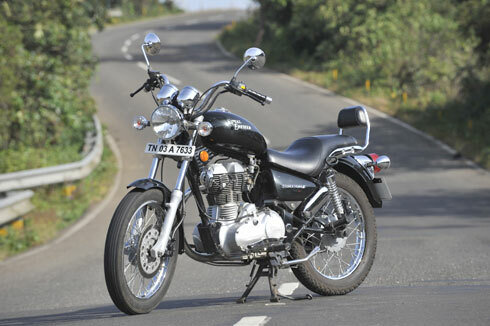 At Rs.1,00,000+ the bike is not cheap, but it is a legend cloaked in modern wizardry. Enfield claims the Thunderbird TwinSpark is maintenance free though only time will tell, as it is too early to comment on this. The dreary general quality, the heavy price tag and the out-of-date technology make sure you do not buy this bike by using your head. Yes, the new engine is better and more modern, but then these are changes that should have been made a long time ago. But looking at the Thunderbird Twinspark as such is missing the point totally. It is a bike you buy with your heart. It looks good but I think it would have been better with alloys and a better paint job with some pin stripes and all that stuff..But it is really classy and will make peoples head’s turn for sure.I think they should have had n extra sixth gear..Anyway overall i think it will be a sure hit. I am a recent bullet convert. But it was not because of Thunderbird. Recently, I had a chance to test ride Thunderbird TSpark. My initial observations have been too much vibration and a rough engine. However, I felt it quite easy to ride comparing against the bulky look it projects. Maybe, the low seating also would’ve helped a short person like me. 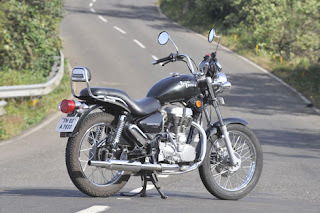 My observation about Bullet in general is, it is a much hyped bike which fairs very poorly on quality scale. Today I gave my bike for the first servicing. By all conservative means of calculating the fuel efficiency, I got an average of 45kmpl+. This includes city as well as highway. 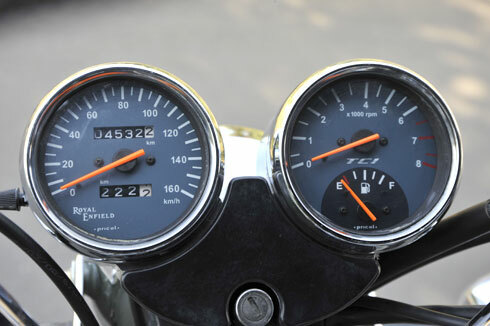 To be noted is that I have ridden the ‘bird max at only 55-60kmph as stated in the manual for the first 500km. The petrol tank leakage as stated above wasn’t a problem. Actually I had not tightened the fuel cap adequately and hence the leakage. As for vibrations, obviously you don’t expect the bull to be as smooth as a honda or a yamaha. Drawbacks: none except it is very expensive. I’ve been driving Thunderbird since last 5 years & have planned to buy new TBTS UCE with thorough check. I completely disagree with the above comments where so many problems were highlighted like oil leakage, vibrations etc infact this new Unit construction engine is so reliable and effecient that RE will be introducing it in his all bikes by 2011. I’m die hard fan of RE, they dont produce racing bikes but they produce great bikes. By the way even Yamaha RX 100 too had oil leakage problem if reved over normal limts so does that means it was a crap? Use your brains guys !!! RE is not for everyone, one needs a big heart to sit on it.